A powerful, funny, richly observed tour de force by one of America’s most acclaimed young writers: a story of love and marriage, secrets and betrayals, that takes us from the backyards of America to the back alleys and villages of Bangladesh. In The Newlyweds, we follow the story of Amina Mazid, who at age twenty-four moves from Bangladesh to Rochester, New York, for love. A hundred years ago, Amina would have been called a mail-order bride. But this is an arranged marriage for the twenty-first century: Amina is wooed by—and woos—George Stillman online. For Amina, George offers a chance for a new life and a different kind of happiness than she might find back home. For George, Amina is a woman who doesn’t play games. But each of them is hiding something: someone from the past they thought they could leave behind. It is only when they put an ocean between them—and Amina returns to Bangladesh—that she and George find out if their secrets will tear them apart, or if they can build a future together. 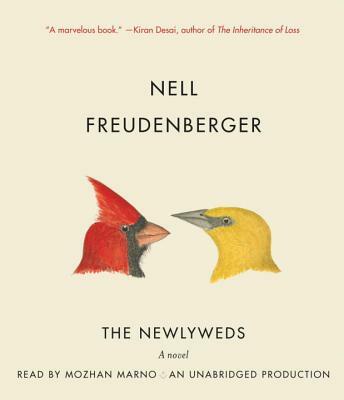 The Newlyweds is a surprising, suspenseful story about the exhilarations—and real-life complications—of getting, and staying, married. It stretches across continents, generations, and plains of emotion. What has always set Nell Freudenberger apart is the sly, gimlet eye she turns on collisions of all kinds—sexual, cultural, familial. With The Newlyweds, she has found her perfect subject for that vision, and characters to match. She reveals Amina’s heart and mind, capturing both her new American reality and the home she cannot forget, with seamless authenticity, empathy, and grace. At once revelatory and affecting, The Newlyweds is a stunning achievement. Nell Freudenberger is the author of the novel "The Dissident" and the story collection "Lucky Girls, " winner of the PEN/Malamud Award and the Sue Kaufman Prize for First Fiction from the American Academy of Arts and Letters; both books were "New York Times Book Review" Notables. A recipient of a Guggenheim Fellowship, a Whiting Award, and a Dorothy and Lewis B. Cullman Fellowship from the New York Public Library, she was named one of "Granta"'s Best Young American Novelists and one of "The""New Yorker"'s "20 Under 40." She lives in Brooklyn with her family.